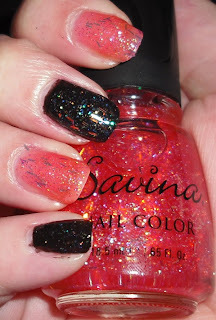 Imperfectly Painted: Savina Fireworks & Birthday Goodies! I wanted to share with you another one of the Savina polishes I got. I'm really loving this brand more and more! I just hope they don't decide to take them away again for a period of time like the one time I visited Nordstrom Rack! Nordstrom Rack please keep your Savinas! I did the swatch this way because I think this would be a great layering polish. I quite like it on its own, but I think it maybe better layered on top of something! Fireworks is a warm-pink sheer base with iridescent glitter and holographic bar glitter mixed in. I love this type of glitter. I don't usually find two types of glitters mixed into one polish. I think this looks amazing over a dark colored polish. It's blingy, but I wouldn't call it overbearing. It has a very interesting layered glitter effect that is neat! Now on to some non-nail polish birthday goodies. On my birthday I went to Target and bought some accessories. Let me just say I'm am fashion challenged. I literally had zero accessories with the exception of maybe 3 bracelets and 1 necklace. I don't need fancy things, but I wanted to a get few things just to throw on to embellish an outfit. Oy, will someone sign me up for "How Do I Look" or "What Not To Wear"? Here are some of the things I got...these could be hideous or completely fashion police worthy. I really don't know since I'm fashion challenged, but I liked them :P.
These are two necklaces I got. 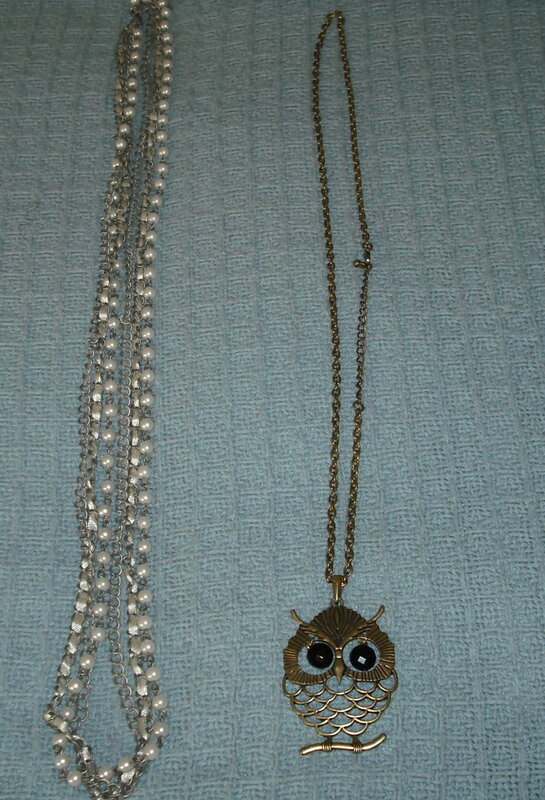 The on the left is like 3 necklaces layered silver chain, silver chain with white ribbon woven through, and another silver chain with pearl-like beads. 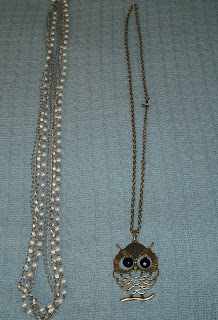 The necklace on the right is an antique-like gold owl. I love owls and thought this was kinda neat looking. I got these sets of bangles. I have feeling bangles are so 1990 or something like that. The one of the left are a set of silver and gold ones with different textures. The one on the right are black and silver mixed bangles with different textures and embellishments. Last but not least here was my small little birthday cake from Target bakery LOL :P. It wasn't personalized just one picked up last minute. It did the job! It was chocolate cake with chocolate buttercream icing...OMG soooo good! That nail polish is really pretty. I'm horrible with accessories too. I don't think I even own any necklaces. The owl necklace is sooo cute!And the polish...I love it how it looks over black! Very interesting glitter--looks like it would be a lot of fun to play with over different colors. Looks just like fireworks! You did good with the accessories, animal jewelry is def. back "in." I love the cake! No, seriously...I'd really LOVE some cake (you know?) I love the lacquer too and yes, seriously, I love that lacquer. I know, sorry, my comments are whacked cuz I'm sick and my brain is fried. 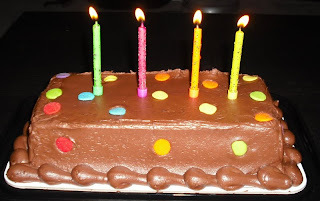 I hope you enjoy your birthday goodies (all the variety) and enjoy your special weekend! That polish looks amazing! I love layering glitters. This manicure is so cool. :) And that cake looks delicious! I awarded you the I Heart Your Blog award too! Lily- Think cake would have to win just in this instance! Michelle- I hear you. I see all these women with accessories and I'm like....I think I'm missing something? Megan- Thanks! I'm sorry if the cake gave you a toothache :P.
Karen- Yeah I definitely want to test on different colors. I'm sure it would look great! Freshie- Oh good! I'm not too off the ball! Cateyez- Yes that polish would perfect for the birthday. Glad you like the owl! Steph- Thank you for the award! 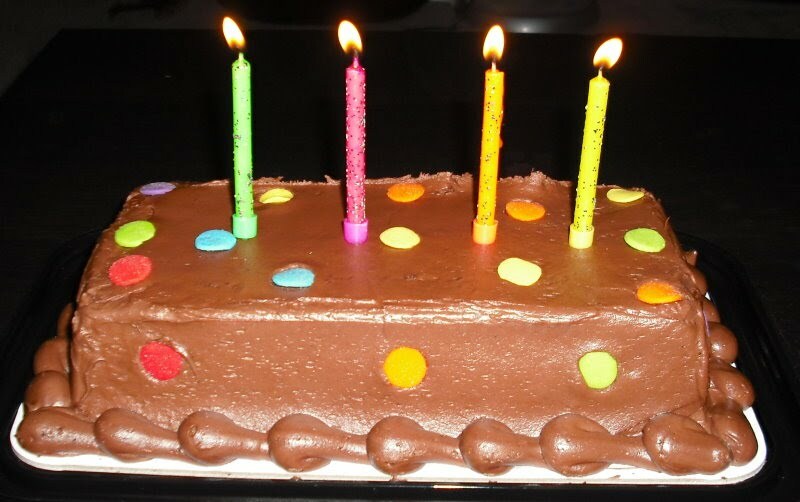 cake looks really delish! yum. Glad you had a nice birthday!